MONMOUTH COUNTY, NJ--(Marketwire - December 18, 2008) - CMSC Spirits Group, Inc. proudly announces their premium spirits products, the award-winning The Spirit of Liberty® America's Cream Liqueur and Espiritu del Ecuador cordial liqueur have both won 2009 World Spirits Competition highest honors of Platinum and Gold Medals, respectively, in the category of World's Best Liqueurs. This comes as a high honor for CMSC Spirits Group who re-launched their two product lines earlier in 2008, under new management. Espiritu del Ecuador, introduced in Ecuador in 1994 and the United States in 2002, is considered the #1 selling liqueur product in its home country. The World Spirits Competition Gold Medal Award marks the first such honor for Espiritu del Ecuador. But, for The Spirit of Liberty®, introduced in 2005 and the only cream liqueur produced in America, this marks the second such high honor, with the first being bestowed the Silver Medal in the 2006 San Francisco World Spirits Competition. The World Beverage Council founded the annual World Spirits Competition in 1991, alongside the World Wine Competition, World Beer Competition, and the World Beverage Competition, cumulatively the World's Largest Beverage Competition. Each year more than 50,000 beverage brands from around the globe compete in this worldwide event in hopes of receiving one of the four coveted awards, Platinum, Gold, Silver and Bronze, bestowed to each brand classification. Espiritu del Ecuador is a unique cordial liqueur blended from a combination of 20 exotic fruits native to Ecuador, including mango, peach, chocolate, vanilla, pear, apple, cherry, almond and many others. Sweet, very complex, delightfully aromatic, and infinitely mixable, this 'distilled spirits specialty' can satisfy almost any palate. Delicately blended and balanced so that no one fruit dominates, Espiritu del Ecuador is a unique and unpredictable liqueur that not only tastes different every time, but brings out passion and romance. 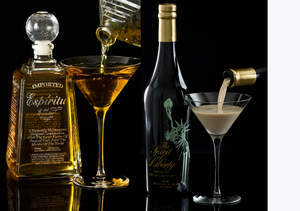 America's Cream Liqueur, The Spirit of Liberty®, is a unique 36-proof blend of America's aromas and flavors that include hints of bourbon, apples, cherries and more. Its subtle combination of flavors work in harmony to deliver an exceptional taste experience that allows drinkers to savor the flavors they like the most. Additionally, The Spirit of Liberty blends smoothly with coffee, foods and desserts, or it can be enjoyed straight up, on the rocks or in a chocolate martini. Distributors and investors interested in more info may contact Tina LoBosco, President, CMSC Spirits Group, atl: tlobosco@cmscspiritsgroup.com or tel: 732-526-7460 or Christopher Buttner, contact info below.